During Christmas I found this pretty cashmere cowl at a ridiculously low price. 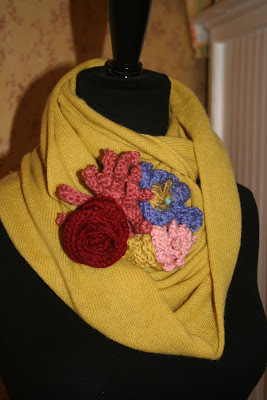 I needed a gift for a friend and decided to add a knitted flower pin to it. Our local yarn store is carrying a line of wool which includes tiny little skeins of yarn. Perfect for making flowers. It was fun and rewarding to see a small bouquet come together. I used this book and would highly recommend it. It allows you to use whatever yarn you have on hand and not only gives instructions for flowers, but for some fruits and veggies as well. I'm going to give it to her today, I do hope she likes it! Ooooh...looks like a wonderful book! Such fun flowers. Been wanting to learn jow to crochet... this just might motivate me. What a lovely gift...I am sure your friend is just in love with this. How could she not love it? So cute and personalized. I know I'd love it. She will love it. Not only is it pretty, but looks so snugly and warm. A book just for knitting and crocheting flowers...how sweet. It tempts me to take that hobby up again. So cute. Looks like a great book. That cowl looks great. How pretty! I know she will love it!!! Thanks for the note on my blog! Glad you are taking the challenge. :) And thanks for the help with finding the pictures. Adorable! My niece loves to crochet flowers I wonder if she has seen this book? Thanks for recommending it, I'll have to tell her. I bet your friend loved it - it's beautiful! I have the same book and yes, it is a wonderful book, very inspirational!